The Thermal Spa department was built for the well-being of our guest with five different tempered outdoor pool to regenerate body and soul. For our sport loving guests we offer a 25m swimming pool from spring to autumn. In the pools adventure elements ensures the time off with showers, air blowers. Our uniquely extended opening time all year – till 2.00 am every day- provides the possibility of an enchanted romantic night bathing with the alighted pools under the open sky. In the summer time on Saturdays we organize the Sunset Beach Pool Party occasionally, the true pool party not only for adults! 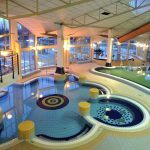 Our Wellness department and indoor pools offers two indoor thermal-curative water pools and one indoor paddling pool for the children. All those who have the courage and would like to try themselves we offer the experience of a big splash. Who has the courage and feels like it also has the opportunity to jump from three different heights in the 4,5m deep water. 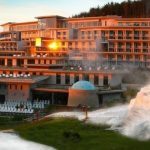 where the different generations have the chance of enjoying the Spa, because as long as the elder generation has the opportunity of resting in the thermal-curative water, meanwhile the younger generation has the opportunity of sun bathing, swimming and diving or sliding down all day long. The slides and the diving pools may be used only with the bracelet bought as an extra after buying the pass for the Spa. Open on public and bank holidays. – 6 different tempered thermal-curative water pools with adventure elements, including a cave pool area. 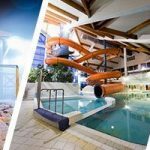 The slides and the diving pool may only be used with a wristband which can only be purchased after you have bought your daily spa enterance ticket. We reserve the right to change the opening hours of the Aqua Park!